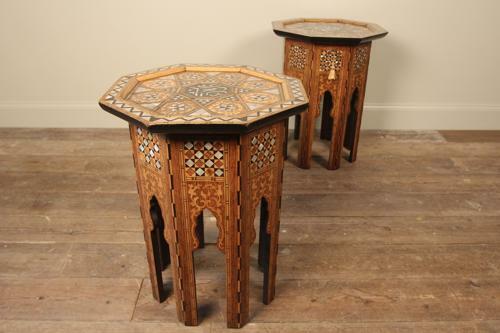 A superb matched pair of small Moorish tables by Liberty & Co, London. These lovely tables in good original condition, one being an Ottoman table with a lift up lid, this reveals the beautiful pale pink silk buttoned lined interior from original. Both tables are profusely inlaid with Abalone and Mother of Pearl along with fine timbers to include Ebony, Rosewood, Boxwood and Satinwood. Having hexagonal tops and bases. raised on an eight legs. Both in wonderful condition throughout. Would make perfect lamp of bedside tables. Circa 1900. *Reference: "Liberty's Furniture 1875-1915, by Daryl Bennett".